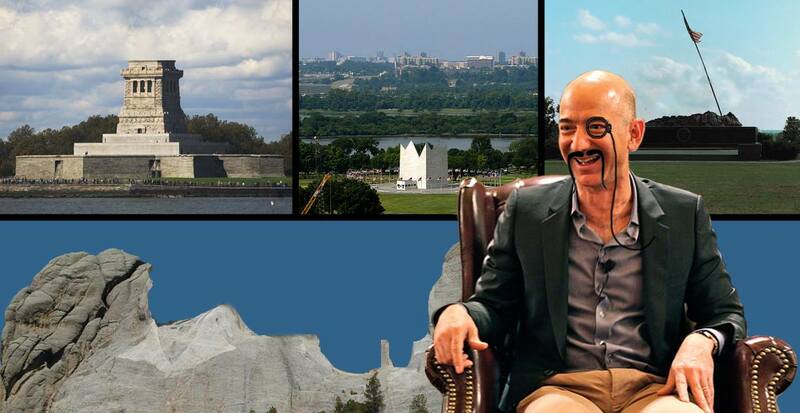 WASHINGTON — Broadcasting live from the bowels of his new lair in Crystal City, Amazon CEO and unapologetic supervillain Jeff Bezos announced yesterday that he had taken advantage of the government shutdown in Washington to finally fulfill his lifelong dream of stealing every single national monument. Due to an ongoing impasse between President Donald Trump and congressional Democrats over funding for a southern border wall, the federal government has been partially shut down since late December. National parks and monuments have been left unattended. Apparently, this opportunity proved too enticing for Washington’s second most eccentric billionaire. Federal authorities are still baffled as to how Bezos was able to make off with every single monument in the Washington metro area, but reports of loud buzzing noises and thousands of low-flying drones seen over the National Mall in recent days may have something to do with it. At press time, the Lincoln Memorial was going for $700 million on Amazon, or $99 if you sign up for an Amazon Rewards Visa Signature Card. Have you been to our online store yet today?